If you haven't linked up for Wear Red Selfies, we're leaving the linky open for a few more days. 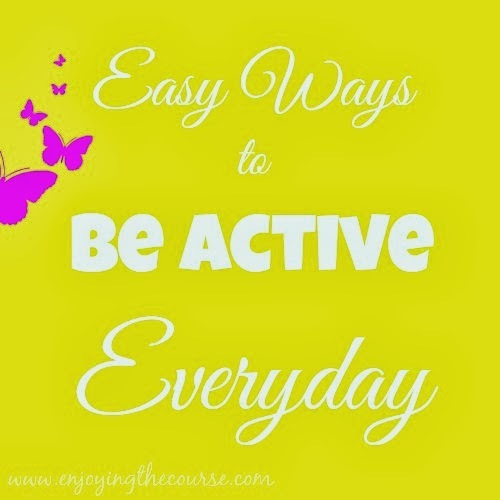 For today's Tuesday's Tip, let's talk Easy Ways to Be Active Everyday. Exercise is very important for a healthy heart. It helps in weight loss, reduces blood pressure and bad cholesterol, and relieves stress. Obviously, I'm a runner and that's my go-to exercise of choice, but let's face it. We all get busy at times, and sometimes we just can't squeeze in a run or a workout. But you know what? You're probably still getting some exercise and doing what you can, when you can totally counts! Housecleaning. You can easily work up a sweat just cleaning around the house. Using a little elbow grease can be a great arm workout. Oh yeah, and if you listen to some music while you're cleaning, you might add in a few little dance steps. Besides, let's be honest, cleaning is just more fun when you're jamming to your favorite tunes. Hey! Do you remember when I reviewed Koss Headphones back in December? How perfect for when you're cleaning the house! Have you heard? They are currently on sale at Walgreen's for only $19.99! Woot!! I may have to get another pair of FitClips, because I love them soooo much. Shopping. I've said it many times maybe not on the blog, but I really believe that if you can walk around shopping for several hours, you can run a 5k. Shopping can be fun, but it can also be exhausting. I know I'm usually ready for a nap when we I get home from a shopping trip. Playing with your kids. Instead of just taking them to the park, play with them while you're there. Run around and HAVE FUN. It encourages both you and your kids to be more active. I don't have any kids myself, but I do have a dog. Kinda the same thing. LOL. If you have a dog, try taking longer walks instead of just a quick jaunt to go potty. So, if you've skipped a workout because you had to go shopping or clean the bathroom, don't worry. You still got in some exercise. And we all know that a little is better than none at all. What's your favorite way to be active in the everyday? love this! ANY movement is good movement!! doesn't have to be a in gym! Great tip! Thank you for linking up with us for Tips and Tricks Tuesday! Good tips. I always count vacuuming as cross training! Vacuuming definitely counts! My husband does all the vacuuming, so I kinda forgot about that one. I get my "real" workout in (run/bike/swim) before I go to work and then I see that I play with the preschoolers during their outside time (pull them in wagons, play tag, push them in the big swing, carry the orthopedically impaired kids around, play soccer, etc.) I get paid for it...hey, someone has to do it! ha! Excellent way to add in a few more steps! Great ideas! I wish I thought of this more often as I went about my day! Thanks for linking up to Tips and Tricks Tuesday - pinned to our Pinterest board! I think it's sometimes easy to forget that all the little things we do still count. Good tips! Cleaning the house and doing laundry if you have a 2 story house is kind of a workout to me. I have 3 sons so I do lots of laundry and haul it up and down stairs. Always good to get a little in over nothing! I agree :) I always get a good work out in cleaning my floors. They are laminate so they just cleaner if I get on my knees spray and wipe. I like to park far away at the store too and make my self walk more if I am having a bad week! Scrubbing floors is like a full body workout - especially when you're on your hands and knees. Great job!